Choosing your wedding cake is one of the funnest (and tastiest) parts of wedding planning. While you should definitely enjoy the process and explore the 2019 wedding cake trends, you should also be mindful of how much you’re going to be spending. Everything from the size of your dessert to what kind of frosting you choose will have an effect on wedding cake prices, so you need to know your stuff before placing any orders! Here are a few money saving tips for your wedding cake. When you think of a wedding cake design, you probably picture a sky-high creation with several elaborate tiers and layers. While those are definitely beautiful, if you’re looking to save big, you’ll need to think small. 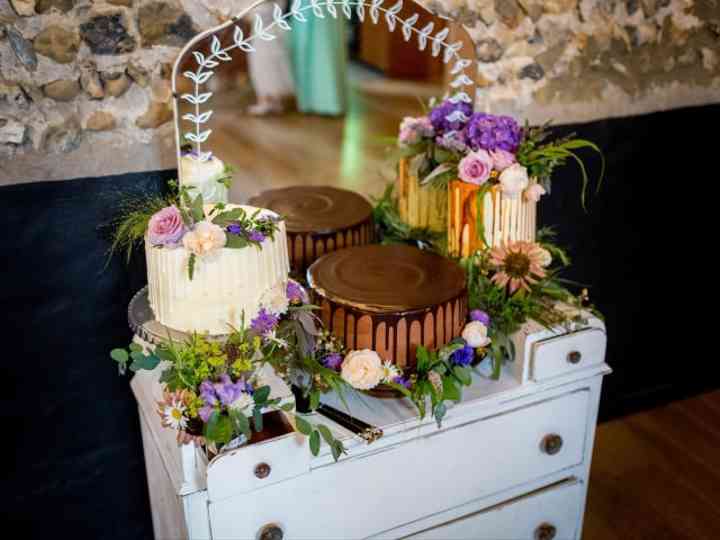 A single-tier cake or petite two-tiered cake will give you all the beauty of a classic wedding cake without the massive bill. Of course, if you are opting for a smaller star confection, you’ll want to complete your spread with other desserts, like cakes and cookies, so that all your guests get something sweet to snack on. Pinterest and Instagram are filled with images of hand-painted desserts, gold-leaf covered designs, geode confections and elaborate floral wedding cakes. All of those are downright gorgeous, but they also come with huge price tags. If you want to save a couple quid, ask your baker for a sleeker, more streamlined design. Chic semi-naked cakes and ruffled confections are just as pretty and (usually) cost a fraction of the price. As you’ve probably learned by this point in your wedding planning journey, custom stuff isn’t cheap. Instead of asking your baker to come up with a brand new design for your wedding cake, choose something from their existing portfolio. Of course, you can ask them to make a few tweaks to fit your personal wedding style. Fondant-coated cakes are typically more expensive than buttercream designs, so go with the latter. From ruffles to rosettes, you have plenty of downright stunning options to choose from with this frosting style. OK, yes, we’re all jealous of Harry and Meghan’s lemon and elderflower cake, but artisanal flavours like that aren’t cheap. If you’re trying to keep wedding cake costs down, skip the bespoke flavour combo and go for one of your bakery’s classic options (nobody’s every disappointed by good ‘ol chocolate and vanilla). Asking a baker to craft a less laborious dessert than a traditional wedding cake will definitely save you a good chunk of money. Donut towers, cupcakes and pies are becoming more and more popular and look (and taste) just as amazing.